Beginning this month, student loan borrowers have a new repayment option to consider, and it could lead to significant relief for an estimated 5 million borrowers. Consumer Credit Counseling Service (CCCS) is taking steps to share important information about this new program and how it will impact those who are seeking more affordable ways to pay their debt. What this means in dollars and sense. The monthly reduction could make a substantial difference for those having trouble making ends meet. Discretionary income for this purpose is calculated as the difference between adjusted gross income (taken from the tax return) and 150 percent of the current poverty line. For this year, that payment would be 10% of what is earned over $17,655 divided by 12 months. For instance, a person earning $30,000 a year would see payments capped at a budget-friendly level of about $102.88 a month. With the addition of REPAYE to the federal loan repayment lineup, borrowers now have eight income-based programs to choose from. Because borrowers may be eligible for more than one program combined with the interaction between student loans and other forms of debt, they are encouraged to reach out to an NFCC® Certified Student Loan Counselor with Consumer Credit Counseling Service to determine which one would be the most beneficial for their individual circumstances. To get started, consumers can visit www.consumercreditbuffalo.org or call 712-2060. This holiday season could be the most wonderful time of year for cyber criminals, according to digital identity company ThreatMetrix. In a new report, the firm reveals that it has detected a 25% jump in attacks. Check out this list from our friends at KNOWBE4 and always be aware when opening emails or clicking on links! This time of year, online scams use a variety of lures to get unsuspecting buyers to click on links or open attachments. Bad guys build complete copies of well-known sites, send emails promoting great deals, sell products and take credit card information – but never deliver the goods. Sites that seem to have incredible discounts should be a red flag. Remember that when a "special offer" is too good to be true, it usually is. For instance, never click on links in emails or popups with very deep discount offers for watches, phones or tablets. Go to the website yourself through your browser and check if that offer is legit. A popular holiday scam is big discounts on gift cards. Don't fall for offers from retailers or social media posts that offer phony vouchers or (Starbucks) gift cards paired with special promotions or contests. Some posts or emails even appear to be shared by a friend (who may have been hacked). Develop a healthy dose of skepticism and "Think Before You Click" on offers or attachments with any gift cards or vouchers! These emails seem to come from retail chains or e-commerce companies such as Amazon or eBay claiming there's a "wrong transaction" and prompt you to click the refund link. However, when you do that and are asked to fill out a form, the personal information you give out will be sold to cyber criminals who use it against you. Oh, and never, never, never pay online with a debit card, only use credit cards. Why? if the debit card gets compromised, the bad guys can empty your bank account quickly. A new phishing email has begun circulating that tricks people into thinking they could win movie tickets for the highly-anticipated film, "Star Wars: The Force Awakens," due out on Dec. 18. However, the email is a phishing attack. Leading up to the film’s release, and shortly after, you need to watch out for this social engineering attack and not fall for the scam. Stay safe online! Susan C. Keating began her career as a trainee at First Bank System in Milwaukee. She worked her way up through the banking industry, eventually becoming CEO of a U.S. bank holding company. For the past 11 years, she has been CEO of the National Foundation for Credit Counseling, the nation’s largest nonprofit credit counseling agency. She was in Buffalo recently to meet with Consumer Credit Counseling Services of Buffalo. Q: People really woke up after the financial crisis in 2008. Did it change their behavior permanently or are they starting to loosen up again? A: My general assessment is that people are much more thoughtful and responsible than they were before the crisis occurred. However, what we’re now starting to see is that as the economy grows and unemployment goes down, people are starting to pick up and increase the amount of debt they’re taking on again. We feel the opportunity through our agencies is to make sure that all the fundamentals are there, that people are working with some workable budgets, that they are careful about tracking what their spending levels are and just making sure that it doesn’t get away from them again. Q: There are stereotypes about the kind of people who live in poverty or who are in debt. What have you seen that dispels some of that? A: I have to tell you, we feel so strongly that we see a new face of poverty in this country. It’s our seniors, who have no funds set aside for a manageable retirement. It’s our kids who are carrying extraordinary levels of student debt. I mean they’re just strapped with this heavy burden of debt that can go on and on and on. It’s our military service members. And then we’ve done quite a bit of work around what we call breadwinner moms. So these new segments that are our neighbors, our friends, our families, those are who we see today as the most vulnerable. Q: Student loan debt is at crisis levels. How did we get here? A: Some would say it’s that people taking on the debt didn’t have the information or the tools or the education to understand what they were signing up for. Others would say it’s really the universities that created the issues. The cost of getting an education has gone up just incredibly, it’s been exponential. You might say that it’s the policy makers that have not put the appropriate checks and balances in place. Q: It’s a huge issue. A: I think going into the elections in Washington we’re going to see this topic emerge more and more as something of serious concern. At $1.3 trillion, student loan debt has surpassed credit card debt. It’s now the second-largest consumer-related debt behind mortgages. It’s going to have spillover in so many areas. Student borrowers are having trouble staying in their homes, buying cars or just basically purchasing the goods and services you’d think they’d be able to afford as graduates of universities. It’s multigenerational, so it’s not just about the millennials’ capacity to have more discretionary income. It’s parents that can’t retire because they’re co-signing and helping their children to pay off debt as well. Q: What will it take to set things right? A: Some of it is getting people to the table. Whether it’s the government, the private sector companies, whether it’s the servicers – all of us have to consider that this is serious. With some policy changes, education, some collaboration at the university level and so forth, I think there are ways to get at this but it’s complicated. It’s seriously complicated. Most of these borrowers have multiple loans with different terms. It’s very confusing. Just having the kind of support from counselors and people that are advocating for them instead of trying to get them into other loans and so forth is very important. Q: Do you think students need to re-evaluate whether they really need to go to college? A: I think culturally, there is this strong American ideal that the way to economic prosperity and so forth is through getting a college degree. And what we’re finding is that there are people who perhaps aren’t suited to go on to a four-year college or on to graduate school. So I think it’s kind of a re-positioning here where it’s important to consider whether it’s realistic to think, given the debt that’s going to be taken on to receive that education, if it’s conceivable that the debt can be paid over a period of time. There are also some abuses and predatory practices out there. A: Well, there are organizations and entities out there that say they can either refinance some of the loans, or provide some support in restructuring them, but the student borrowers end up in even worse shape in terms of their ability to pay back those loans. Or they end up with incredible additional fees being tacked on and so forth. That’s one of the roles that the regulators in Washington have really taken on. They’ve taken some pretty strong positions with companies and organizations to address it. WEST SENECA, N.Y. (WIVB) – The CEO of the nation’s largest nonprofit credit counseling agency is sounding the alarm about the student loan crisis. Susan Keating is President of the National Foundation for Credit Counseling (NFCC), and pointed to figures that show college loan debt has now reached $1.3 trillion. As CEO of the NFCC, Keating is considered a foremost authority on the effects of consumer debt on Americans and the U.S. economy. The financial services executive was in town, Friday, to talk about the state of the financial services industry with local banking officials, and the staff of the Consumer Credit Counseling Service of Buffalo, the local affiliate of the NFCC, at their offices in West Seneca. Keating said young people saddled with college debt, which is second only to home mortgage debt–and more than what Americans owe on their credit cards–has become a drag on the U.S. Economy, standing in the way of buying homes, new cars, and other consumer goods. The answer to the crushing college debt load is complex, said Keating, but one part of the solution could be making sure students and their families understand exactly what they are signing up for when they take out student loans. If you or a family member need help managing student loans, the Consumer Credit Counseling Service of Buffalo (CCCS) has a program that can help, and the agency offers a wide of array counseling programs to fit your needs. CCCS President Paul Atkinson is the chairman of the NFCC’s Operating Committee. The woman who leads the National Foundation for Credit Counseling, based in Washington, D.C, is in Buffalo Friday to meet with local financial leaders and share what her organization considers a disturbing trend in personal finance. Susan Keating visited the WBFO studios and sat with reporter Michael Mroziak to share some of her message. While the nation has, in general, pulled out of the Great Recession, individual households continue to face serious challenges. About 70 percent of American households, according to the NFCC, face some sort of issue including low savings, credit card debt, a mortgage or student loan debt. While some numbers are encouraging, including drops in unemployment, bankruptcy filings and mortgage delinquency rates, Keating noted that there are signs that those trends may shift and start increasing. Help for Struggling Student Loan Borrowers! Since the launch of CCCS of Buffalo’s Student Loan Counseling program in 2012, the need for borrowers to obtain guidance with their student loans continues to grow. With student loan debt reaching $1.2 trillion, second only to mortgages in regards to total consumer debt, and 5 million borrowers of the 43 million federal student borrowers in default, it is easy to see why. Once a federal borrower is in default, they can face garnishment of their wages (known as Administrative Wage Garnishment) by the federal government, which places an additional burden on an already struggling borrower. At this point in default, it can be extremely daunting and difficult to initiate the steps needed to bring the student loan accounts back to a current status, and many borrowers become discouraged, and give up. At this point, the borrower could face years of negative payment history, and poor credit scores, limiting their ability to build assets. CCCS of Buffalo has been expanding our Student Loan Counseling program, and is now able to assist in these difficult situations. Counselors help the borrower identify the next steps, communicate with the servicer/collection agency, and develop an action plan to bring the borrower’s student loans out of garnishment, and back to a current payment status. Not only will this help the borrower re-establish positive payment history, but it also puts them back on the path to benefit from income-driven repayment plans, and possibly even forgiveness programs. If you or someone you know is struggling with student loan debt, whether the student loans are current, delinquent, or in default, CCCS of Buffalo can assist. Contact 712-2060 for more information. Your life quite literally depends on paying off student loan debt as rapidly as possible. Being able to afford a house and start a family are so much easier if student debt is handled. Student loan debt is estimated at over $1.2 trillion and is growing by over $3,000 each second. With an estimated 40 million Americans saddled with student loans, only about 37% of borrowers are making any effort to pay off their student loan debt. Please visit Money Nation for the full article. Who Struggles With Student Debt? Lisa Frankenberger, Student Loan Counselor at Consumer Credit Counseling Service of Buffalo, New York, says the clients she helps to pay down student debt are a good mix between new graduates and people in their 20s, 30s, 40s and beyond. They might owe anywhere from $8,000 to $200,000 or more. If you’re struggling to pay down student debt, you’ll find a group of excellent ideas in our list below of 8 ways to pay down student debt. Student debt is situational. It depends heavily on the individual’s income level, specific debt amount, interest rate, future earning potential, future plans and more. People trying to pay down student debt should think about where they are financially now and also where they want to be in the future. An honest assessment of your situation can help you figure out the best way to tackle your debt. Unfortunately, nowadays the majority of people aren’t in a great financial position that would allow them to make extra payments. Credit counselors see a lot of people looking at affordability issues. They’re saying, my student loan payments are due, they’re asking for $800 a month and there’s no way I can afford that. Or maybe they can afford it but they have to prolong starting a family or buying a home because they have so much going out to their student loans that they can’t really afford anything else. For those people, a different payment plan can present an option that can take a lot of the pressure off paying down their student debt. Federal student loans particularly offer lots of different repayment options such as income based repayment plans, deferment or forbearance time, extended repayment plans, or student loan debt consolidation. The Standard Repayment plan generally requires all student debt to be paid within a ten year period, with payments of at least $50 per month. This plan results in higher monthly payments but less interest paid in overall. Income Based Repayment plans tie monthly payments to the debtor’s income in some way, for example as a fixed percentage of their income. They result in lower monthly payments but usually more money paid in over the life of the loan. Pay as You Earn Repayment plans are Income Based Repayment plans, but with payments tied to a lower percentage of income. The plans are only available to those with student loan debt who have a partial financial hardship. Income Contingent Repayment plans are Income Based Repayment plans that also take family size into account to help create lower monthly payments. Income Sensitive Repayment plans are Income Based Repayment plans, but they give lenders a bit more leeway in determining the borrower’s monthly payment. Graduated Repayment plans start with low payments and then increase over time. They last up to ten years and allow payments to match a rising level of personal income. Extended Repayment plans offer lower monthly payments by extending the student loan debt repayment period out to as much as 25 years. They result in a higher dollar amount paid in overall. Consolidation lets borrowers group several student loans together to create a single monthly payment. They take a lot of the confusion out of paying down student loan debt, but they can result in a higher overall interest rate in some cases. Deferment or Forbearance time gives students a grace period when they don’t have to make any payments at all. During this time however, interest on the student loan debt continues to accrue. Public Service Loan Forgiveness erases student loan debt for qualifying borrowers who work for qualified employers in the public sector. “So there’s a lot of different programs with federal student loans that you can look at for different ways to go,” says Frankenberger. Several student loan debt repayment plans exist that allow borrowers to tie their monthly payments to their income. The plans include Income Based Repayment plans, Pay as You Earn plans, Income Contingent Repayment plans, Income Sensitive Repayment plans and Graduated Repayment plans. They all have subtle differences but they all give people lower monthly payments in exchange for making more total payments over a longer period of time. An extended student loan debt repayment plan is a plan that extends the repayment period to as much as 25 years. The upside of these plans is that they have lower monthly payments of standard 10 year plans. The downside is that you’ll pay more over time on your student debt than you would under a plan with a shorter term. Some of the Income Based Repayment plans extend your repayment period out to 20 or 25 years from the original 10 years under the Standard Repayment plan. That means you’ll pay more money over more time with those plans. 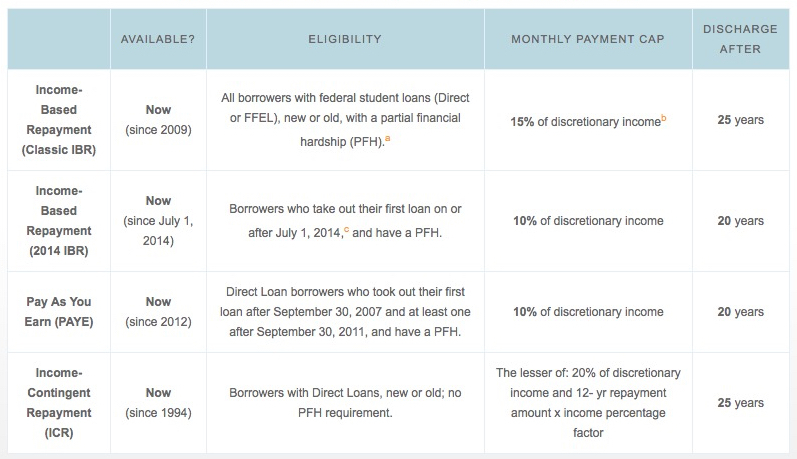 Typically when you graduate and your federal loans go into repayment, you’re on a standard ten year repayment plan. That’s automatically what repayment plan you’re on unless you request something different. The standard ten year plan is the way to get your loans paid off at the fastest rate and with the least amount of interest because you’re getting them paid off in a shorter time frame. Carrying student loan debt for a longer period under these plans could impact things like buying a home. Lenders are going to look at your total debt load. If you have a significant amount of debt and an income that’s not enough to support both your student loan debt and the additional debt of a mortgage, that could impact your ability to get a house. Consolidation of federal student loan debt can make repayment a lot simpler. You have one payment to one servicer rather than potentially four separate payments to four different servicers. That’s nice, but you’re also taking away the ability to pay more on your higher interest loans first. That’s because when you consolidate, your student loans all going to have a single interest rate. But there are also benefits to consolidating. Apart from the added simplicity of a single monthly payment, consolidating creates a new block of potential forbearance and deferment time. A deferment is a block of time when you don’t have to make payments on your student loan debt. Deferments can last up to three years. A forbearance is a reduction or stoppage in monthly payments on student loan debt that can last as long as 12 months. Consumers should be careful with deferments and forbearances because with a forbearance, while you’re not required to make a payment, your interest is still accruing. So that loan balance is growing while you’re not making payments. When you defer, the interest is being covered on the subsidized portion of your loans, but on the unsubsidized portion it still is accruing. There’s a largely overlooked program for paying off federal student loans that’s called Public Service Loan Forgiveness. Public Service Loan Forgiveness can wipe out student loan debt entirely after a set period of time. Be in a direct loan program. If your loans are older and you’re not in a direct loan program, you can consolidate to get them into the direct loan program. You also must have made 120 qualifying payments under an income based repayment plan. You must work full time for a qualifying employer. For anyone who meets the above criteria, their remaining loan balance can be forgiven. Public Service Loan Forgiveness is geared toward the nonprofit world. Jobs that qualify for forgiveness include jobs with any employer that’s tax exempt, positions at true nonprofit organizations, government jobs and also jobs with other agencies that are considered qualifying public service. This can include jobs at public schools or in the public health care industry and law enforcement. Jobs with the Peace Corps and Americorps can also qualify for student loan forgiveness. The biggest downside of student loan debt forgiveness is that it’s taxable as income. Someone who starts out with $100,000 in student loan debt and then gets $50,000 of that debt forgiven will owe taxes on that $50,000 as if they earned it as income. That could add up to a sizable tax bill. It’s important for anyone who wants to pay off their student loan debt to take an individualized look at their situation, because everybody’s situation is different. It’s not always cookie-cutter, which doesn’t make it easy, but it’s always good to have options. It feels good to be able to make an informed decision for yourself about your best path to paying off your student loan debt after you’ve explored everything and you really have a thorough understanding of it. Websites like the U.S. government’s StudentLoans.gov can help people get a grip on all their options for paying off student loan debt. Their FAQ page in particular provides a lot of great information on different repayment and counseling options. The services of a good nonprofit credit counselor can help. Frankenberger helps people pay off student loan debt through the Consumer Credit Counseling Service of Buffalo, NY. To find a nonprofit credit counselor near you, do a search at the National Foundation for Credit Counselors website by clicking here. Private student loans don’t have as many options as federal loans do. Federal loans have deferments and forgiveness and income based plans. Private loans typical model is that you borrowed this money at this interest rate, so you’re going to pay it. In some cases they’ll offer small forbearances here and there or some sort of assistance if you get behind, but they’re definitely not as flexible as federal loans are. The biggest thing you want to look at with your private student loans is the interest rate. It is possible to refinance a private student loan. There are lenders out there that will refinance and even consolidate private student loan debt. So for example, someone with three or four private student loans might be able to consolidate just to one. There are several major banks and financial institutions that offer refinancing and consolidation for private student loan debt. For a complete list, click here to visit FinAid.org’s private student loan page. There are also options to switch private student loans to a fixed interest rate rather than a variable interest rate. It’s very important when you have private loans to make absolutely sure your credit score is up to par and you’re managing your credit well. That’s because in order to refinance, you’re going to have to show that you can handle debt responsibly, and that means having a solid credit score. It’s a good idea to try to build your credit to a point where you can potentially refinance those private student loans to get yourself a better interest rate. You could also then potentially save money by extending your repayment just like you can with federal loans. For instance, say right now you’re in a ten year plan with your private loans. You could refinance that into a 15 year repayment. Then you’re going to pay more interest in the long run, but that might be a way for you to get a more reasonable payment right now.